Deborah C. Waters was inducted into Super Lawyers 2015 as an outstanding lawyer who attained a high degree of peer recognition and professional achievement. Virginia Governor Terry McAuliffe appointed Deborah C. Waters to the Board of Commissioners of Virginia Port Authority. 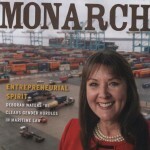 The Authority’s mission is to foster and stimulate the commerce of the ports of the Commonwealth and related facilities by serving as the United States eastern seaboard gateway for the global import and export of freight throughout the world, to promote the shipment of freight through the maritime and inland ports, to seek to secure necessary improvements of navigable tidal waters within the Commonwealth, and in general to perform any act or function which may be useful in developing, improving, or increasing the commerce, both foreign and domestic, of all maritime and inland ports of the Commonwealth and related facilities. Deborah C. Waters was admitted to the United States Supreme Court Bar, an honor very few attorneys are privileged to receive. Norfolk maritime lawyer Deborah Waters represents eleven crewmembers of MAERSK ALABAMA for maritime personal injury during pirate attack. Norfolk labor lawyer Deborah Waters quoted regarding International Longshoremen’s Association labor strike. The National Labor Relations Board overruled 50-year precedent by holding union dues check-off must continue even after a collective bargaining agreement expires. In WKYC-TV, Inc., 359 NLRB No. 30 (2012), the board overruled its longstanding decision that, upon expiration of a collective bargaining agreement, the employer no longer has authority to deduct union dues from it employee’s paycheck. As of December 28, 2012, the reverse is true. The Board backtracked from its previous position largely because unions depend on dues to operate and stopping dues deduction provided a tactical advantage to an employer engaged in the collective bargaining process. Now, stopping check-off deduction is no longer an option. Because of this decision, unions retain continuity of dues payments which provide necessary funding for their day to day operations.